Best Buy got a boost from Super Mario in the first quarter, as demand for Nintendo’s new Switch game console helped the retailer post a surprise sales gain. Comparable-store sales — a closely watched benchmark — rose 1.6 percent, the company said on Thursday. Analysts had predicted a decline. Best Buy’s earnings also topped analysts’ projections, sending the shares to a record high with their biggest rally in nine months. The Switch, which debuted March 3, has emerged as a bright spot in a lackluster retail industry. Last week, Target said its electronics sales “leapt forward,” thanks to the Switch, which it promoted in stores and online. In April, the electronics category overall posted its first monthly gain in almost two years, according to government data cited by RBC Capital Markets. Best Buy also saw robust gains in laptops — once a declining category — thanks to premium offerings above $500 from suppliers like Microsoft. Shares of Best Buy surged 21.5 percent to $61.25 Thursday, the biggest intraday increase since August. They had gained 18 percent this year through Wednesday’s close. Analysts had projected that same-store sales would drop 1.5 percent in the first quarter, which ended on April 29. Excluding some items, earnings jumped 40 percent to 60 cents a share. Wall Street had estimated 40 cents. The results backed up the company’s claims that 2017 would be the year it shifts into growth mode after a long stretch of cutting costs, selling off foreign divisions and improving operations. E-commerce sales, which grew 23 percent last quarter, helped drive the expansion. Best Buy also has revamped stores with areas dedicated to top brands such as Apple, Samsung, Beats and Microsoft. Joly said the improved customer experience helped it increase sales while the overall market for U.S. electronics declined. Best Buy predicted another comparable-sales gain in the current quarter, with growth ranging from 1.5 to 2.5 percent. It expects revenue of $8.6 billion to $8.7 billion, ahead of the $8.48 billion estimated by analysts. “Our second-quarter guidance reflects the continuation of much of the positive category momentum we saw in the first quarter,” Chief Financial Officer Corie Barry said. Earnings will be 57 cents to 62 cents in the period, excluding certain items. Analysts have projected 59 cents. Sales in the entertainment category, which includes games, rose 11 percent last quarter. That was the best performance since 2014, said Bradley Thomas, an analyst at KeyBanc Capital Markets. Best Buy is also gaining market share as competitors fall by the wayside, Joly said. The bankruptcy and liquidation of HHGregg Inc., which left $1 billion in appliance sales up for grabs, has been a net positive. That will continue this quarter, he said. 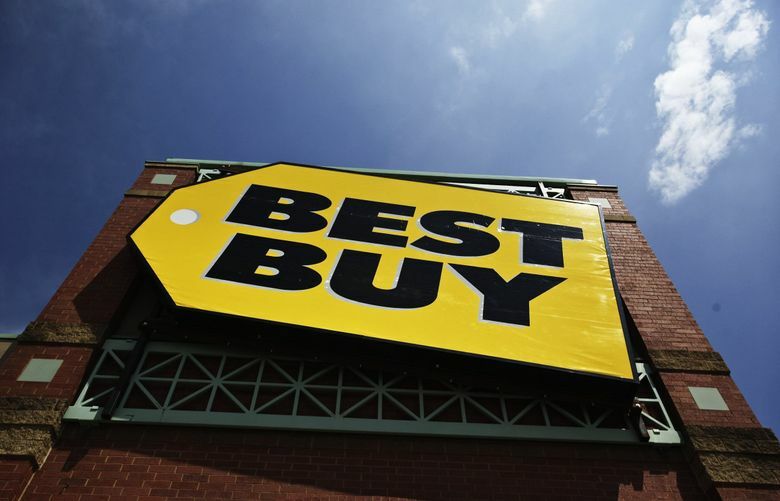 Best Buy looks like it will be the last big-box electronics chain standing, said David Schick, director of research and lead retail analyst for Consumer Edge Research. Its beating of Wall Street expectations last quarter is meaningful, he said in a note. “Best Buy remains a post-apocalyptic retailer in our view,” he said.